At our November meeting, which was held Sunday November 12th at the Museum of Flight, former SpaceX project manager and technical writer Crystal Moore gave an excellent presentation of her experiences while working for SpaceX for the last two years. Her slide deck which has some great photos has been uploaded here. 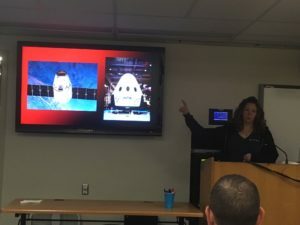 Also, she shared this Youtube video link which is a look ahead at what’s next for SpaceX. We also discussed some of the past conferences that folks have attended as well as upcoming conferences. James Burk (our organizer) will be speaking at the December meeting, providing an overview of all the Mars Society projects currently going such as the recently-began MDRS field season and the Marspedia online encyclopedia. Also, James is planning to start an additional series of chapter organizing meetings starting in January, which will be held on the Eastside, likely at the Orange Studios co-working space (which his company owns). We will also continue to have a presence at the monthly NSS Seattle meetings which are held every 2nd Sunday of the month at 7pm at the Museum of Flight’s Red Barn classroom. Everybody is welcome to join! This entry was posted in Meeting Minutes on November 20, 2017 by jburk.